Home / News / Introducing the 145 Kasp Marine Padlock Range – Designed to Weather any Storm! 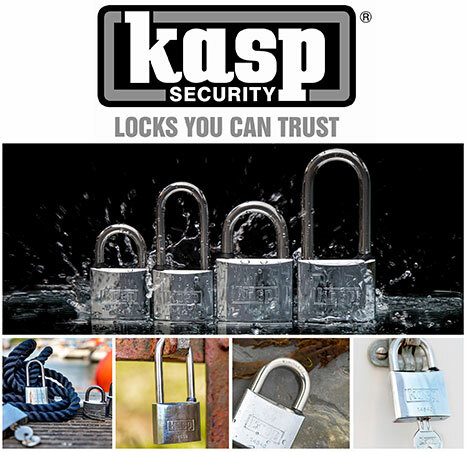 Kasp, the leading brand in security from Carl Kammerling, is launching a superb high quality Kasp 145 Marine Padlock Range. Specifically designed for outdoor use – even in extreme weather conditions – the 145 Marine range is perfect for withstanding corrosive salty air conditions in coastal areas. Designed and manufactured to the highest standards and backed by the Kasp ten-year guarantee, Kasp 145 Marine padlocks are available in two security levels (medium and high); 40mm and 50mm, standard and long shackle, both keyed to differ and keyed alike combinations.